Earlier this month, Canada’s National Women’s Under-18 hockey team captured gold by winning a hard-fought final against perennial adversaries, the United States of America, by a score of 3-2. The tournament, held in Obihiro, Japan, ran from Jan. 6-13. The win was the fifth for the Canadian team, which took 23 players to the tournament. The U18 team was part of the hotly-contested Group A which included powerhouse hockey nations USA, Russia and Sweden. Leading up to the championships, Canada marked a 4-3 overtime win over Russia in the semi-finals after defeating the same squad 5-1 in game three of the round robin. The team posted a 3-2 round robin win over the USA in its second game of the tournament and started the tournament with a 2-1 win over Sweden. That roster included defender Megan Carter, whose parents are from Seaforth and whose grandparents, Bruce and Marg Whitmore, live in the Winthrop area, and Maddi Wheeler who has connections in the Brussels area. Carter now calls Milton home, and plays for Stoney Creek in the Provincial Women’s Hockey League (PWHL). In her past three seasons, Carter has earned 12 goals and 36 assists over 93 games, as well as two playoff goals and three assists over 15 playoff games. Her previous national experience includes the 2018-19 National Women’s Under-18 series against USA in August of last year, the 2018 National Women’s Under-18 Team Selection camp and the 2017 National Women’s Under-18 selection camp where she played five games, earning one assist and was named an alternative for the team. She’s committed to Northeastern University in Boston. In an interview with The Citizen, Carter said that finding out about making the team was a relief for her. She said that being part of the team that played against the USA in August and played in Japan, which was mostly the same squad, was a very exciting experience for her, made all the sweeter by beating the USA. She said that being able to say she and her teammates are world champions is something she will always cherish, only made more impressive by the fact that it’s been five years since Canada had won the tournament. This is Carter’s last year of eligibility for the U18 league, and she now hopes to try out for Canada’s Under-22 team. “Obviously I want to keep climbing, and building on this huge success,” she said. Carter has also been signed to represent Team Ontario in the upcoming Canadian Winter Games in Red Deer. The event is held every four years and runs from mid-February to early March. The women’s hockey tournament is scheduled to start Feb. 24 and run to March 2. 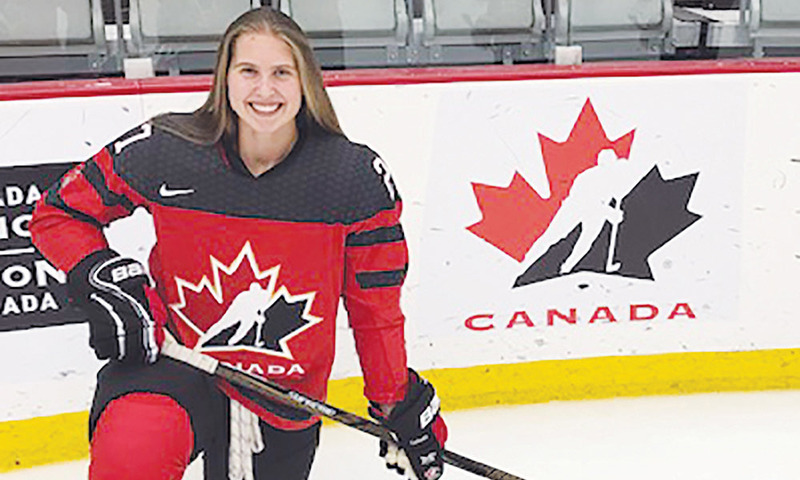 Playing with Stoney Creek will keep her nose to the grindstone in getting prepared for the Canadian Winter Games, Carter said, as she has two to three practices a week, two to three games a week and training to boot. Wheeler earned the game-winning goal in the final against the USA, scoring off her own rebound 1:34 into the first overtime period of the match. Canada had a 4-3 powerplay at the time, which was where the team excelled. Team Canada was first in powerplay conversions for the tournament with a 29.03 power play percentage. The goal was her first of the tournament, but Wheeler was no stranger to the score sheet, having earned at least one assist in each of the four games leading up to the final, notching two in Canada’s 5-1 win over Russia. Wheeler played AAA Quinte Boys hockey for six years and currently plays in the U20 PWHL for the Nepean Junior Wildcats near Ottawa. Her previous experience representing the country also includes playing for the National Women’s Under-18 team in a series against the USA last year and playing at the 2018 National Women’s Under-18 team selection camp. Wheeler has played the last three seasons in Nepean, earning 25 goals and 37 assists over 99 games and two goals and nine assists over 20 playoff games. She’s pledged to play for the University of Wisconsin in the National Collegiate Athletic Association (NCAA) for the 2020-2021 season.